Who can not remember those funny looking cartoons of walking dogs and crawling men on the streets of SOHO and the village in 1979? These small cryptic characters were done with such subtlety, even a kind of grace. New York walls and subway cars during the late seventies were laced with the anarchy of twisted color, and I often felt like I was living in a prison; everywhere tags assaulted us. I was never fond of graffiti nor I have I changed much from that opinion over time. 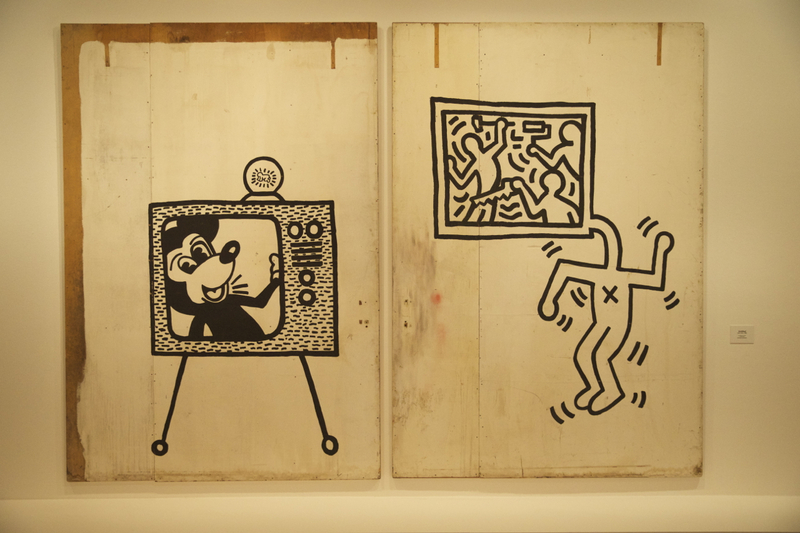 So, Keith Haring's small endeavors around curbs, street gutters and lampposts were a welcome surprise for me. Of course, afterward he then became such a big star that I kind of lost interest in him over the years. And yet, I would see him around from time to time; coffee shops and bookstores in the village although I didn't know him personally. 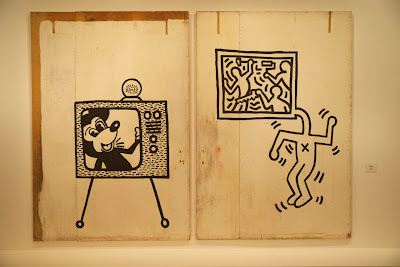 At the Musee d'Art Moderne in Paris I had gone to see Derain, Dufy, and Bonnard, not to see Keith Haring. But as I go see everything, anywhere, anytime, I made my way into the cavernous rooms where giant colorful canvass' were simply hung up without any frames. I only wished that I had had the instinct to film so much more than I did because with each room as I penetrated this show I increasing became more and more overwhelmed by the outburst of this guy's creativity. And, in truth, its not even the kind of painting I particularly enjoy, and yet, I found myself very moved by the show as a whole. He not only exhibits a wonderful graphic style, but also a tremendous sense of humor. He reveals a quiet intelligence, one which seems so prescient now looking back in time, one which offered a gritty and cryptic vision of our hurried lives today. I think that if he had lived a normal life span he would have grown into a more sophisticated painter. I see something in his late things which move away from that easy and familiar graphic style, one at which he became so adept, and into something more cohesive in an abstract way. It looked like he was moving into the less familiar and more painterly which is always more artistic than doing over and over again that which we know how to do. This is a great show and one which offers lots of surprises.